What a precious moment you've captured.! 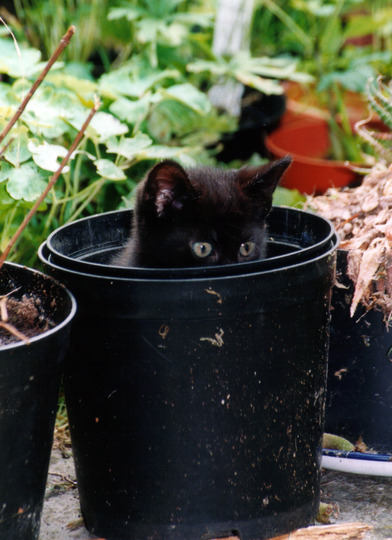 what is the fascination with sitting in plant pots?? when i find one big enough i think i'll sit in it and see what it's like haha!! Extremely adorable!!!!!!! Soooo adorable~ What a great pic to have captured!!!! ........I can see you Jo Jo. Ahhh ! The art of camouflage and concealment. And a cat in a bucket ! How about a 'Pic Of The Month/Week/Day' feature ? This pic would be the one !! Call it 'Pic Of The Crop' !! Oh, he's really gorgeous, bet there's a snail or slug creeping along there in front, just look at those eyes, mesmerised!! So, let me get this straight...If I don't clear the cat-whoopsee out of the dirt, this is what grows from it ?! Cute....but how often do I water it, will it go well on a windowsill or in front of the fire, maybe on a nice rug...? Will it need much tending to......? Should have called the kitten 'Davros'. Wonder if it's looking for the 'Catpeople' ? Awwww - how cute - bet he's all grown up now.